We’ve all heard that breakfast is supposed to be the most important meal of the day, but do you know why? A healthy breakfast fuels your body with calories so that your body can function. It provides needed nutrients, especially phytonutrients from fruits and vegetables. 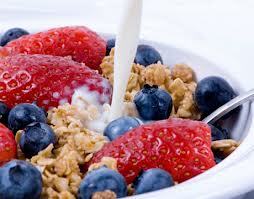 Also, eating breakfast can help boost your metabolism and that may help with weight loss and weight control. Plan ahead so that you have time to eat breakfast. Sometimes I take out what I need the night before. For example, I usually have oatmeal, so I’ll take out the oats, a bowl, a spoon, and a measuring cup. Then in the morning I don’t have to go looking in the cupboards and drawers for these items. All I have to do is cook the oatmeal, and add cut up banana or blueberries, and walnuts, flax seeds or chia seeds. A high fiber, low sugar breakfast cereal is another option. Add low-fat milk or almond or soy milk and fruit for a satisfying healthy breakfast. If you eat dairy, adding fruit and a spoonful of walnuts or almonds to plain yogurt is a good choice. Breakfast can consist of any leftovers of whole grains like quinoa or brown rice and vegetables, or an omelet with leftover vegetables and a side of cooked beans. You could even have soup for breakfast or a salad. Just like your other meals, a healthy breakfast will be comprised of some fruit or vegetables, whole grains, lean protein, nuts, seeds, and/or legumes.